This artist's concept depicts an itsy bitsy planetary system. In fact, it's so compact that it's more like Jupiter and its moons than a star and its planets. 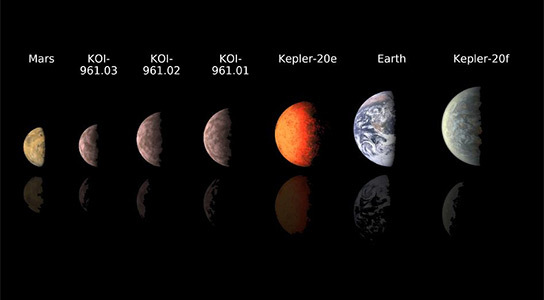 Astronomers using data from NASA's Kepler mission and ground-based telescopes recently confirmed that the system, called KOI-961, hosts the three smallest exoplanets known so far to orbit a star other than our sun. All three planets are thought to be rocky like Earth, but orbit close to their star. That makes them too hot to be in the habitable zone, which is the region where liquid water could exist. Of the more than 700 planets confirmed to orbit other stars — called exoplanets — only a handful are known to be rocky. This chart compares the smallest known exoplanets, or planets orbiting outside the solar system, to our own planets Mars and Earth. 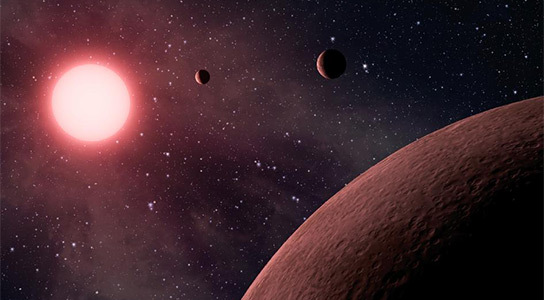 Astronomers using data from NASA's Kepler mission and ground-based telescopes recently discovered the three smallest exoplanets known to circle another star, called KOI-961.01, KOI-961.02 and KOI-961.03. The smallest of these, KOI-961.03, is about the size of Mars with a radius of only 0.57 times that of Earth. The latest discovery comes from a team led by astronomers at the California Institute of Technology in Pasadena. The team used data publicly released by the Kepler mission, along with follow-up observations from the Palomar Observatory, near San Diego, and the W.M. Keck Observatory atop Mauna Kea in Hawaii. Their measurements dramatically revised the sizes of the planets from what originally was estimated. 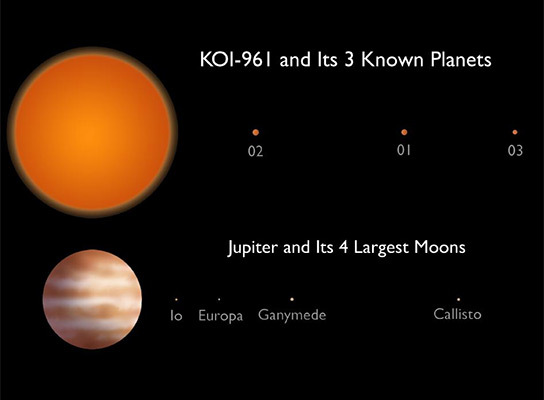 This artist's conception compares the KOI-961 planetary system to Jupiter and the largest four of its many moons. The KOI-961 planetary system hosts the three smallest planets known to orbit a star beyond our sun (called KOI-961.01, KOI-961.02 and KOI-961.03). The discovery follows a string of recent milestones for the Kepler mission. In December 2011, scientists announced the mission’s first confirmed planet in the habitable zone of a sun-like star: a planet 2.4 times the size of Earth called Kepler-22b. Later in the month, the team announced the discovery of the first Earth-size planets orbiting a sun-like star outside our solar system, called Kepler-20e and Kepler-20f. For the latest discovery, the team obtained the sizes of the three planets called KOI-961.01, KOI-961.02 and KOI-961.03 with the help of a well-studied twin star to KOI-961, or Barnard’s Star. By better understanding the KOI-961 star, they then could determine how big the planets must be to have caused the observed dips in starlight. In addition to the Kepler observations and ground-based telescope measurements, the team used modeling techniques to confirm the planet discoveries. NASA’s Ames Research Center in Moffett Field, Calif., manages Kepler’s ground system development, mission operations and science data analysis. NASA’s Jet Propulsion Laboratory, Pasadena, Calif., managed the Kepler mission’s development. Be the first to comment on "Three Smallest Exoplanets Found by NASA Kepler Astronomers"